The NRSV Popular Text Edition is an entirely new setting using the New Revised Standard Version Anglicized Edition, the Bible translation recommended for use in the Church of England and other churches. The Anglicized Edition uses British spellings and punctuation. 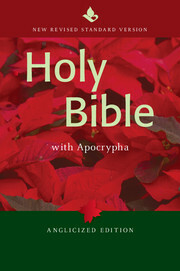 This Bible includes the Apocrypha. It features clear, easy-to-read print, well laid out with generous page margins and space between the columns. The text is helpfully broken up with bold section headings, and running heads show chapter and verse for easy navigation. The text is printed on gilt-edged paper and there is a presentation page and ribbon marker. The Bible is bound in black French Morocco leather, and comes in a presentation box. It would make an excellent gift for Christmas, birthdays or other special occasions. When you hear Cambridge University Press, you think of quality, tradition and prestige. And as you should. Founded in 1534, it is the oldest printing house in the world. In those 481 years, they have garnered quite a reputation for their top of the line printings. And they are not one to disappoint. We previously did a review of Cambridge University Press’s Heritage Edition of the Book of Common Prayer/Authorized King James Version combination. It is one of the most exquisite books I have ever had the pleasure of holding in my hands. 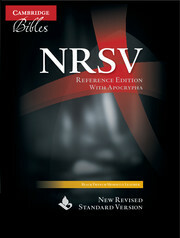 So when I noticed that Cambridge University Press also prints copies of the NRSV translation, I was immediately interested in reviewing it for our Bible series. As anyone who knows me knows, I love the NRSV. It is by far my favorite translation. That being said, I feel it is often printed and presented in such a bland way that I don’t find myself utilizing it as often as I would like. 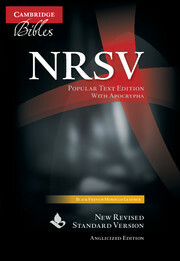 There are very few publishers who print the NRSV. You have Oxford, which is famous for the New Oxford Annotated Bible with Apocrypha NRSV, which is an often used when one is in seminary or doing a scholarly approach to the Bible. It is not suited for use in church or prayer settings. 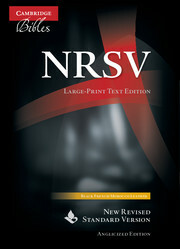 Hendrickson Publishing prints a faux leather NRSV that is geared towards the personal use and for taking to church etc. But the quality is nowhere near that of the NOAB. 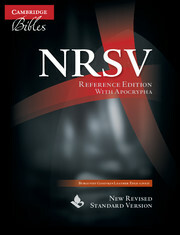 Well I am pleased to announce, I have finally found the PERFECT NRSV Bible out there. The NRSV Popular Text Edition with Apocrypha by Cambridge University Press brings to the table everything that had been missing in my life. High Quality Binding, Paper, and Format all brought together in one beautiful tome. This version is bound in elegant French Morocco Leather, and is sturdy enough to not be so flimsy you would drop it, but not so stiff that it would not lay flat. There are no reference notes, or commentaries written in the margins or the footer section. It is merely the text no fluff. This is perfect for taking to Church, Bible Study, or use in the Daily Office or other devotionals. The quality of the paper is superior to any of the bibles I have had the pleasure of reviewing. It is sturdy, without feeling rough and cheap, and the pages do not stick despite being gilded. The font sits well on the page, with little to no bleed through. The layout of the bible is also perfect. In Text only Bibles sometimes the layout is a bit strange, and it’s hard to get through the text due to it. That is not the case with this Bible. The layout compliments the text perfectly, and makes for extreme readability. The Old Testament, Apocrypha, and New Testament are separated by a title page for each, and this separation is most welcome. I have searched and searched for a NRSV that was worth recommending to you that would be perfectly suited for daily use that was quality. And this is the perfect match. I have to say, Cambridge University Press truly loves what they do, and their love of craft is evident in each piece they produce. The NRSV Popular Text Edition with Apocrypha is a testament to this. If you have a loved one who is in the process of being Confirmed, graduating high school and about to leave to pursue College, or really any occasion, and you would like to give them a wonderful gift that will give them years of use, then this would be something I recommend. And I would not counsel you against purchasing a copy for yourself. It is well worth it. 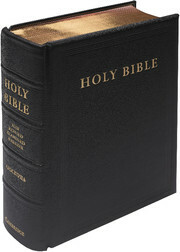 For me this bible is paired perfectly with the Book of Common Prayer, and is wonderful for praying the Daily Office. It is not too bulky, can be carried easily with you wherever you go. When it comes to bibles, there are certain expectations that are set by a publisher when you receive and use one of their bibles that happens to be a splendidly produced volume. So what do I think of the NRSV in French Morocco leather? Not surprisingly, this is yet another superbly designed bible from the folks at Cambridge University Press. I’ve had this one for a while now (it arrived on my doorstep some months ago) and, like the previous editions I’ve reviewed from Cambridge, this bible is wonderfully fashioned. Let’s begin with the binding. In comparison to other bibles I’ve reviewed (NIV Pitt Minion in black goatskin, HCSB in top grain cowhide, ESV in brown calfskin), the French Morocco is definitely the least supple. That’s not to say it’s rough and not enjoyable—quite the opposite—it’s rather nice. In contrast to the others mentioned, French Morocco is grainier and coarser, but that doesn’t mean that it’s unappealing. Though not as soft as other premium leathers, French Morocco is still a quality skin and will likely endure as long as or longer than softer leathers. The appearance is nice, too. Though time and use has dulled it quite a bit, the aroma of French Morocco is like the others—a hearty, aromatic leather that I can still detect. Being a Cambridge bible, I anticipated a certain level of quality and, needless to say, these expectations were met. The overall craftsmanship of Cambridge bibles is first rate—there’s not corner cutting or shortcuts taken. 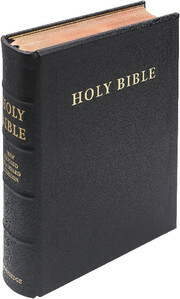 This bible simply feels solid and that’s a plus for any bible that’s going to be used with any regularity. In terms of the bible’s features, it’s pretty much a bare bones package—front matter (table of contents, letter from the translators) and the biblical text, including Apocrypha—that’s it. There are no indexes, no maps—just the text. For some this may be disappointing, but not for me. Like many of you, I have more than enough bibles with plenty of additional material in them should I want to read text and have supplemental information at hand. So, when I get this bible out, it is typically only to read and/or check how this translation handled a particular question of syntax or the like. On that note, this bible’s size also adds to its functionality (it measures out at 8.5 x 5.5 in). Because it’s stripped of any superfluous extras, it’s a perfect size to carry along in your bag/backpack or to keep handy for reading or referencing (as I do). The text is printed on gilt-edged paper, which itself doesn’t allow text to bleed through as much as more inexpensive bibles, and the font is adequately sized (Lexicon 8.75) for reading without undue strain. There are footnotes throughout, though they take up minimal page space, and there are no cross references or other similar “helps”. Also, since this is the Anglicized version, British spellings are employed throughout. In sum, all you really need to know is that this is a Cambridge bible, so you can rightly assume that it is of the highest quality. As with my others from Cambridge, I fully expect this one to last at least my lifetime and beyond!